Our company is extremely involved in providing a comprehensive range of Ita Gold Sandstone that give luxury and elegance to the place. We are offering this slatestone in everlasting sizes, designs and colors. The offered slatestone is designed using premium quality raw material and progressive technology by vendors’ experts. - Widely used during building erection. An ever popular golden sandstone, this delivers a classically warm spectrum of colours- from the deepest russet hues of ochre to a chalky grey. The riven finish offers a beautifully antique natural effect whereas the honed finish gives a luxurious satin look & feel. 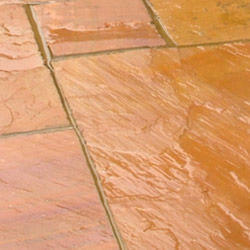 Golden Sandstone are the stone which are used since ancient times for domestic and houseware constructions. They are easy to carve as they are relatively soft.